A book that doesn’t tell its story – For the fainthearted . . . If it could speak, the book would have stories to tell from the three centuries of its life. Printed in London in 1725 by John Baskett, the Book of Common Prayer is bound together with The Whole Book of Psalms Collected into English Metre printed in London in 1725 by William Pearson. 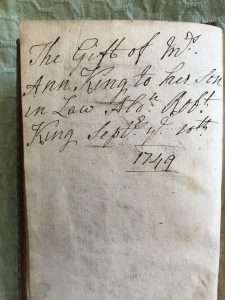 On the title page is written, “Bought by Ann King” and “R.K. 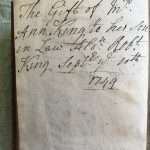 1726.” Who was Ann King and who had felt it necessary to note that she was the buyer of the book? Had R.K. written the words? One would hardly note oneself as the purchaser, particularly on the title page of a prayer book. “The Honourable Robert King” seemed a name amenable to an Internet search, and immediately there appeared an Honourable Robert King who had come from a titled family in Co Roscommon. He seemed a strong candidate to have been recipient of the book, were it not for the fact that he had died unmarried. Searches through the genealogy of the King family of Roscommon brought no other person likely to have been the Honourable Robert King, son in law of Mrs Ann King. 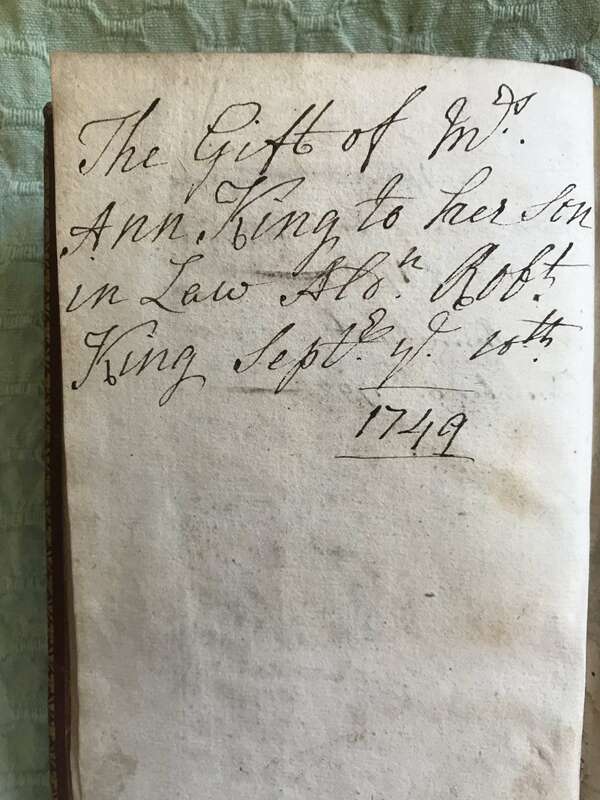 Sharing the surname of his in laws, Robert King seems likely to have married a cousin, a common enough occurrence in the Eighteenth Century, but there were no such combinations in the King family tree. Perhaps the family were not from Ireland, perhaps there were two Honourable Robert Kings and one lived in England, England because the Scots would not have been using the Book of Common Prayer. Like the Honourable Robert King, Captain John Kennedy Strong of South King Street, Dublin seems to have died at the wrong time to have been connected with his namesake in the prayer book. For the moment, the provenance of the book remains a mystery. Were it able to speak, perhaps it would cause confusion with its descriptions of the complexities of family relationships. Part of my degree was a section on palaeography where you were dealing with style of hand to best guesstimate when it was written. Amongst other outside like Whitby and Bede. Here we can say ’twas printed in 1725. And sometime after it was bought by Ann, and probably a Robert King sometime after that date. We don’t know where. The next bit is the Hon, which put them into the house of Lords. Of course then we had a choice of three. Excellent!I love to know the provenance of things. (My grandmother worked in the post office savings bank with Hannie Collins and was given a torch that was said to have belonged to Michael Collins. My father has it now, but there is no provenance with it).